Torrington- Joseph J. Roman, 94, passed away February 6, 2019. Born the youngest of 10 children, in a farmhouse bedroom in Torrington to Charles and Mary (Wersauskas) Roman. He was married for 62 years to Mary (Ohotnicky) Roman, who passed away on November 19, 2018. Joseph attended St. Francis School and Torrington Highschool, where he held many Track and Field records. A WWII Vet, he attained the rank of Staff Sergeant, serving in Company C of the 15th Infantry Battalion of the 3rd Division of the U.S. Army. He served as a foot soldier in North Africa, Sicily, Italy, France, Germany, and Austria. Notably, Joseph and the 3rd Infantry were responsible for capturing Hitler’s summer house in Austria. He was hospitalized on four occasions for various reasons during his two year campaign. A highly decorated soldier, Joseph received the Purple Heart for being shot by machine gun fire while fighting in France. 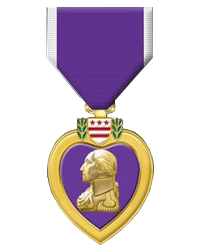 He was also awarded the Bronze Star, Silver Star, Combat Infantryman Badge, Croix de Guerre, European-African-Middle East Campaign ribbon with 4 Battle Stars and Bronze Arrowhead, the Good Conduct medal, WWII Victory medal, the Occupation medal, Presidential Unit Citation with two oak-leaf clusters, and the 15th Infantry “Can Do” pin. After the war, Joseph graduated from Arnold College, Central Connecticut State University, and the University of Hartford, earning three degrees and his 6th year Teaching Certificate. He taught in public elementary schools and retired as Principal of South School. Joseph was a volunteer firefighter for the Burville Fire Department, an auxiliary State Police Officer, and a 3rd degree member of the Knights of Columbus. He had a love of all that was outdoors, photography, and carpentry. Joseph was a lifelong communicant of St. Francis of Assisi Church, Torrington, and headed the C.Y.O. program for 500 students. He was also a greeter, lector, and Eucharistic Minister. Devoted to his faith, he attended daily mass when he was able. He is survived by two sons, Peter J. Roman and his wife Karen of Jensen Beach, FL and Vincent G. Roman of New Hampshire; two daughters, Susan E. Murphy and her partner David Grunwald of Old Saybrook and Sally M. Alexander and her husband Thad of Torrington; and five grandchildren, Jessica M. Pretak and her husband Greg, David Alexander and his wife Kristina, Matthew T. Alexander, Samantha Murphy, and Sydney Murphy; and many nieces and nephews. Funeral services will be held Monday, February 11, 2019 at 10:30a.m. from Gleeson-Ryan Funeral Home, 258 Prospect St., Torrington, to St. Francis of Assisi Church, 160 Main St., Torrington, for a Mass of Christian Burial at 11:30a.m. Entombment with full Military Honors will follow in St. Peter Mausoleum, Torrington. Friends may call Sunday, February 10, 2019 from 4:00 to 6:00p.m. at Gleeson-Ryan Funeral Home.